Ulysses S. Grant, call your office. Island disputes beckon in the Far East! Here’s a historical curiosity. Best known as the scourge of gray-clad Confederates — “I can’t spare this man; he fights,” President Abraham Lincoln reportedly exclaimed on one occasion — Grant dabbled in Asian diplomacy in his post-Civil War, post-presidential life. And he did so in a quarrel that still makes headlines. In the 1870s as now, China and Japan were feuding over control of the first island chain. Grant interceded when asked. At issue was control of the Ryukyu Kingdom. For centuries the kingdom had occupied a kind of political limbo, acknowledging “dual subordination” to China and Japan. Tough neighborhood. Japan, however, burst out of seclusion after its Meiji Restoration of 1868. As it gazed outward, the imperial leadership coveted control of Japan’s southern maritime rampart. It embarked on a stepwise approach toward annexation, reducing the Ryukyus to a feudal domain in 1872. For their part, Qing Dynasty potentates wanted to preserve the Ryukyus’ status as a Chinese tributary state. Matters deadlocked. Enter Grant. The general and his family had embarked on a grand tour of Europe in 1877, after departing the White House. Among the highlights: a meeting with Chancellor Otto von Bismarck, Germany’s chief unifier. As Grant’s biographer William McFeely tells it, however, the family finally “had enough of the restless crisscrossing of Europe” and set out for Asia via Suez. They tarried at Bombay, where a malicious British viceroy reported the president got “drunk as a fiddle” at dinner one night. They journeyed on to Burma, Singapore, Siam, Cochin China, Hong Kong, Canton, and Shanghai. They took ship to cruise up the Yangtze River. At Tientsin, they met General Li Hung Chang, whom the Americans considered “the Bismarck of the East,” a national unifier. Li had conquered the Taiping Rebellion during some of the same years America fought its Civil War. He greeted the visitors with the rather self-serving claim that “You and I, General Grant, are the greatest men in the world,” having subdued “the two greatest rebellions known in history.” Li was “so impressed with Grant,” reports McFeely, that he asked the ex-president to carry a message to the Meiji government regarding the Ryukyus. 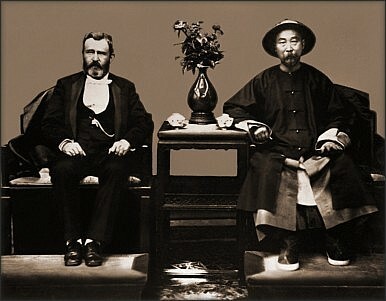 Grant agreed, and Chinese and Japanese emissaries opened negotiations. Tokyo ended up incorporating the archipelago into metropolitan Japan, as part of Okinawa Prefecture. Concludes McFeely, “Calmly, even cordially, Ulysses Grant had made another conquest” in the imperial palace “and achieved another notable surrender.” Why Grant as interlocutor? Well, part of it was simple happenstance. The Grants happened to be traveling in the Far East at a propitious time. Why not enlist the president’s good offices? Getting China and Japan to talk was no small feat. No one likes to look like a supplicant in world politics, especially when dealing with a historic antagonist. Conscripting an impartial and prestigious mediator offers a face-saving way to establish contact. Neither party appears to be making obeisance. They can meet as equals if they have an influential go-between. Both appear to be doing their intermediary a favor. That’s a nifty way to break the ice. And as General Li (as opposed to his Virginia cousin General Robert E Lee) pointed out, Grant was an ideal mediator. He enjoyed outsized street cred in Asia at that particular time. He had helped reunify a divided nation. That was bound to resonate with inhabitants of East Asia, where the Taiping Rebellion and Meiji Restoration were recent memories. The victor of Appomattox Court House, furthermore, was synonymous with American power. Many foreign observers saw the United States as the next big thing in power politics after it won its Civil War, marched an army to the Mexican frontier to reassert the Monroe Doctrine, and otherwise announced it was back after being consumed with internal travails. In short, U. S. Grant was the right man at the right place at the right time to bear a hand in diplomacy. Not a bad template for future mediators. Tokyo’s 2015 defense white paper highlights concerns over Beijing’s maritime ambitions in Asia.